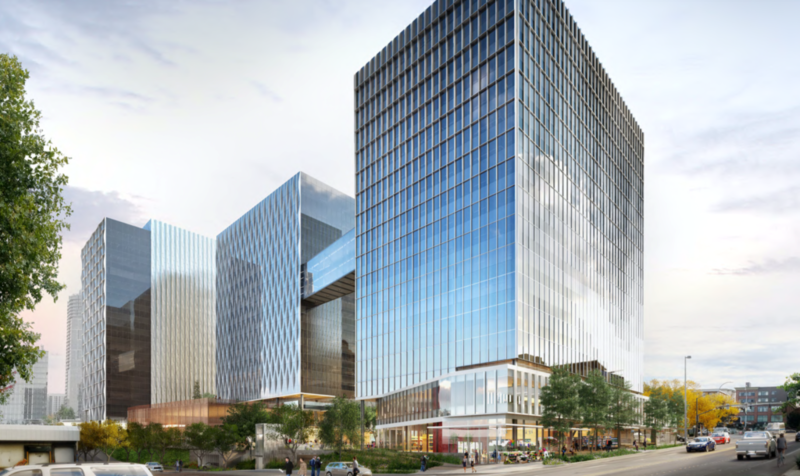 According to permits submitted to the city of Bellevue, Seattle-based Vulcan Real Estate proposed a new project, “Bellevue Plaza”, which will be built in the City Center South district of downtown Bellevue. The half-block development will be located on the West side of 106th Avenue Northeast between Northeast 2nd Street and Main Street. The site includes Jiffy lube and Locksmith. Bellevue Plaza will be constructed in three phases, with each phase consisting of about 300,000 square feet of office space, as well as ground-level retail and parking space. The proposed project will be approximately 877,000 square feet of office space in three towers, 23,000 square feet of ground-level retail, open space, a through-block connection for pedestrians, and below-grade parking.